﻿Published by Sareth Ney on Oct. 26, 2017 at 3:37 p.m.
PONTE VEDRA, Fla. – Colin Quinn’s world tour brings him to the Ponte Vedra Concert Hall, on Feb. 18. He is an actor, comedian, director, producer and writer. In film, Quinn could be seen in the following: “Rock ‘n’ Roll Hotel”, “3 Men and a Baby” , “Crocodile Dundee II”, “Married to the Mob”, “Who’s The Man?”, “A Night at the Roxbury”, “Crooked Lines”, “Harold”, “Paper Boys”, “Grown Ups”, “Cheat”, “Booted”, “That’s My Boy”, “Grown Ups 2”, “Trainwreck” and “Sandy Wexler”. Television works featuring Quinn were: “The Cosby Show”, “2 Hip 4 TV”, “Manly World”, “True Blue”, “The Ben Stiller Show”, “Carol Leifer: Gaudy, Bawdy & Blue”, “The Larry Saunders Show”, “The Christmas Tree”, “Saturday Night Live”, “Windy City Heat”, “What About Sal?”. “Beyond the Comics”,Lat Week Tonight with John Oliver”, voiceover work for “The Awesomes”, “The Nightly Show with Larry Wilmore”, “Inside Amy Schumer”, “Horace and Pete”, “The Jim Gaffigan Show”, “Last Convict Standing” and “Girls”. 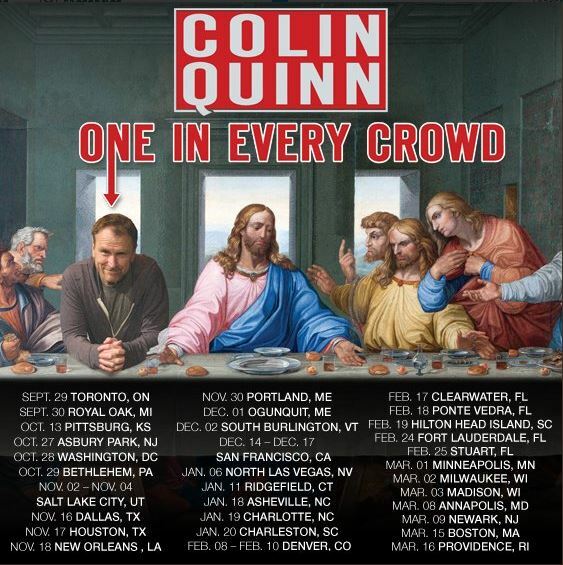 ​As a writer, Quinn contributed to the following: five episodes of “Remote Control”, “Manly World”, eight episodes of “In Living Color”, “Celtic Pride”, 40 episodes of “Saturday Night Live”, three episodes of “The Colin Quinn Show”, 15 episodes of “Tough Crowd with Colin Quinn”, “Colin Quinn: Long Story Short”, “Colin Quinn: Unconstitutional”, “1 Milhão de Anos em 1 Hora”, 26 episodes of “Cop Show” and “Colin Quinn: The New York Story”. He was the writer of the book, “The Coloring Book: A Comedian Solves Relations In America”. It was released on June 9, 2015 and available as a hardcover book, audiobook, audio CD and on Kindle. Quinn was the associate producer of “Celtic Pride”. He was also the executive producer for three episodes of “The Colin Quinn Show”, 15 episodes of “Tough Crowd with Colin Quinn”, “Colin Quinn: Long Story Short” and 25 episodes of “Cop Show”. For one episode of “Cop Show”, he served as the director. There were three comedy specials available by Quinn: “The New York Story”, “Unconstitutional” and “Long Story Short”. “The New York Story and “Unconstitutional” were both viewable on Netflix. “Unconstitutional” is also available on iTunes and broken down into ten tracks: “The Second Amendment”, “Race Today” ,’This Change (Article 4-7), “NRA (2nd Amendment), “Franchise (Article 4)”, “America’s Drunk Budget (Preamble)”, “Media (1st Amendment)”, “Founding Fathers”, “Religion (1st Amendment)” and “The Country Is Getting Divorced”. Tickets to attend Quinn’s performance range from $33 to $50. They exclude fees. Oct. 27 - House of Independents, Asbury Park, N.J.
Oct. 29 - Musikfest Café, Bethlehem, Pa.
Nov. 24 - Governor’s Comedy Club, Levittown, N.Y.
Nov. 25 - McGuire’s Comedy Club, Bohemia, N.Y.
Dec. 2 - Higher Ground, South Burlington, Vt.
Jan. 11 - The Ridgefield Playhouse, Ridgefield, Conn.
Jan. 12 - Valley Forge Casino, King of Prussia, Pa.
Jan. 18 - The Orange Peel, Asheville, N.C.
Jan. 19 - Booth Playhouse at Blumenthal Performing Arts, Charlotte, N.C.
Jan. 20 - Charleston Comedy Festival at Sottile Theatre, Charleston, S.C.
Feb. 17 - Capitol Theatre – Clearwater, Clearwater, Fla.
Feb. 18 - Ponte Vedra Concert Hall, Ponte Vedra, Fla.
Feb. 19 - Arts Center of Coastal Carolina, Hilton Head Island, S.C.
Feb. 24 - Amaturo Theater, Fort Lauderdale, Fla.
Feb. 25 - The Lyric Theatre, Stuart, Fla.
March 3 - Majestic Theatre - Madison, Madison, Wis.
March 8 - Rams Head On Stage, Annapolis, Md. March 9 - Victoria Theatre at New Jersey Performing Arts Center, Newark, N.J.
March 16 - Columbus Theatre, Providence, R.I.